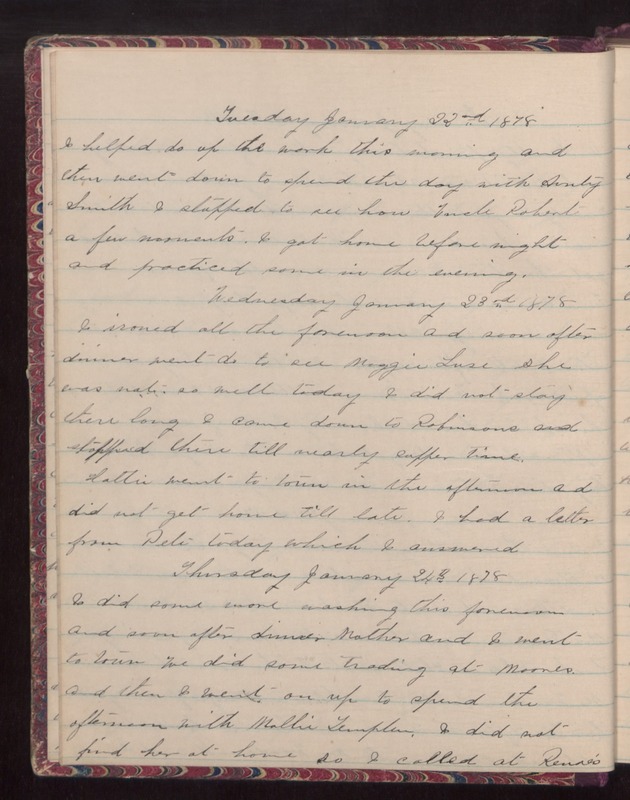 Tuesday January 22nd 1878 I helped do up the work this morning and then went down to spend the day with Aunty Smith. I stopped to see how Uncle Robert a few moments. I got home before night and practiced some in the evening. Wednesday January 23rd 1878 I ironed all the forenoon and soon after dinner went do to see Maggie Luse. She was not as well today. I did not stay there long. I came down to Robinsons and stopped there till nearly supper time. Hattie went to town in the afternoon and did not get home till late. I had a letter from Pete today which I answered. Thursday January 24th 1878 I did some more washing this forenoon and soon after dinner Mother and I went to town. We did some trading at Moores and then I went on up to spend the afternoon with Mollie Templer. I did not find her at home so I called at Renae's.